Being heart-broken is an extremely painful experience, the pain is less expressed as it is hidden and emotional. We will share with you six of the most serious symptoms of heartache backed by science. You are more likely to feel stressed out and anxious when going through a break-up. This is driven by a massive drop in dopamine with an increase in adrenaline, that can create panic situations you will struggle to understand or control. There are two types of eating disorders usually provoked by a broken heart, usually depending of the person’s relationship with food. Some people will see food as a treat and would eat enormous amounts of ice cream, chocolate or even savoury comfort food. They find a certain comfort while overeating, which can lead to dangerous patterns every time one is down. On the other hand, we have people who would unconsciously punish themselves by starvation, as well as the person who broke their heart, by trying to attract their attention and make them feel bad for what they have done. This can also be a loss of appetite without having anything to do with punishment or attracting attention. This is perhaps the most dangerous symptom as it can go on for a very long time. Studies have shown that the lack of serotonin which is referred to as the happiness hormone, was one of the main reasons people were down or felt depressed. In several studies; depressed patients were given a dose of serotonin and some of them started feeling better, of course if the person is naturally depressed serotonin won’t be enough to help. Just like eating disorders, a heartbreak can disturb your sleeping habits. Some people tend to oversleep, this does not look like a depression symptom, but sleeping more than eight hours a day when your mood is lower than usual is not a good sign, somehow you are escaping reality by spending more time asleep. On the other hand, Insomnia is a lot more obvious. If you struggle sleeping for a couple of days after the break up that is more than normal since you are more stressed out and anxious, however if it does become a habit be careful, as it is red flag sign of depression. When going through a heart break, we usually prefer to be alone, dating is often a no go. Of course, taking the time to digest and accept what you have been through is completely natural. The issue in locking yourself in, is more a matter of time and negative thoughts that can run through your mind. Not sharing how you are feeling and letting it out it can depress you even further as you will be alone and will for sure feel lonelier. When we are in love or in a good relationship, we have more energy and we are more often happy and excited than down and tired. If fatigue lingers and is accompanied by low mood and decreased motivation or interest, this lack of energy may be tied to early signs of depression due to losing your other half. 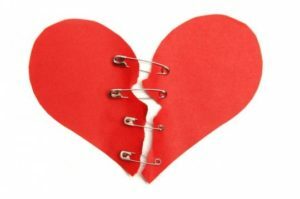 The purpose of this article is to raise awareness about how hard a heartbreak can be. All these negative symptoms are difficult to deal with, however we believe being aware will help you stand up quicker and move on with your life, by not letting a past relationship take over your life.